The autograph with text says: "Come up and see me sometime Bill, Anytime. 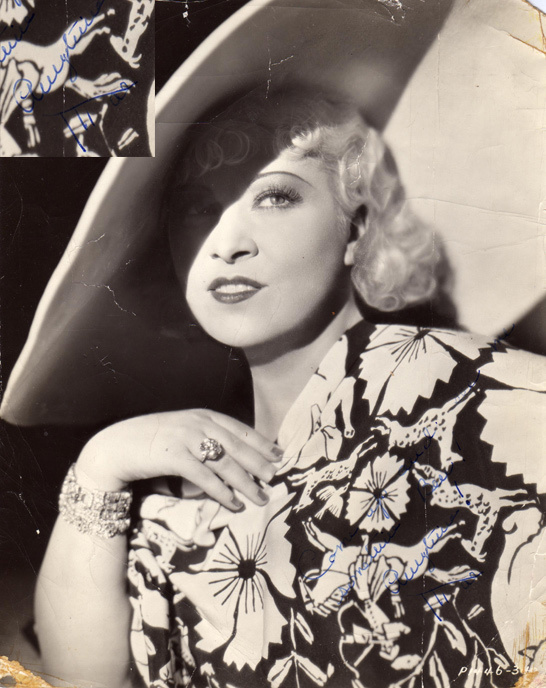 Mae" 2 problems with this - First, Mae West's line was "Why don't you come up sometime and see me?" 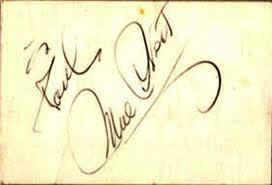 And secondly, I can't find any signature of hers that looks like this one. This either makes this very rare or very fake. Her actual signature is this image to the right. 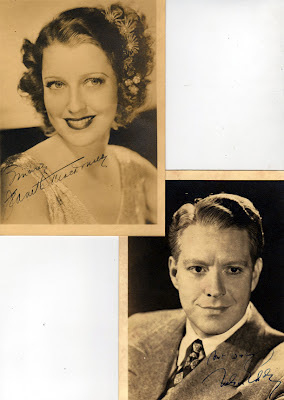 In 2 other scrapbooks I found more than I'll ever need to know about Nelson Eddie and Jeanette MacDonald. I did find what may be original signed pictures...but I'm not sure. Nor am I interested enough to know if they are real or copies of copies. Finally, if you are a fan Hollywood, I found a signed still of Marjorie Reynolds. 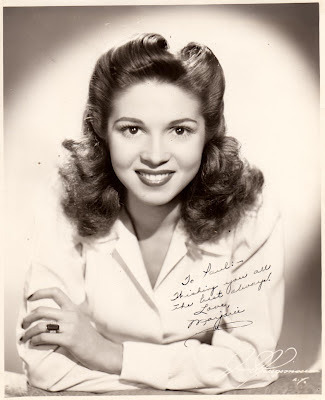 Best known for her role in "Holiday Inn" she never made it as an "A" actress. Finishing her career as the wife of William Bendix in the TV series "Life of Riley." She started in silent pictures and ended in TV, not a bad run for an actor. She died in 1997. My only advice is: Don't throw out any scrapbook before looking through it. Marjorie Reynolds had a minor film role in Gone With the Wind, where she played a "guest at Twelve Oaks". She is seen gossiping about Scarlett O'Hara on the stairs of Twelve Oaks - where her one line of dialogue in the film is delivered off camera.